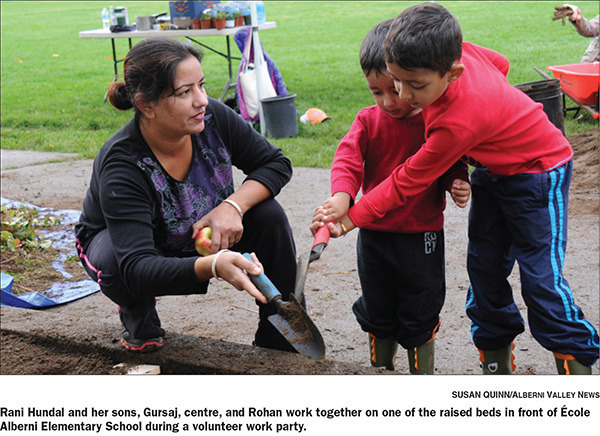 GARDENING: | Parents pull together to make school garden a priority for children at École Alberni Elementary. An Alberni Elementary School student helps plant at a school garden work party. When children at École Alberni Elementary School are hungry at recess, they don’t have far to go for a snack. “We have kids eating kale every recess and lunch hour,” said Laurie Morphet, school principal. And the best part about the kale? The kids grew it themselves, in the school’s garden. Local grower Heather Shobe coordinated the garden program five years ago; this year organic master gardener and farmer Sherry Lyons has taken over. Lyons is excited to see the kind of cooperation that parents, teachers and children have in the spirit of the garden. Earlier this month parents gathered for a work party and Lyons was amazed to see how much progress was made in one hour. The school has 70 feet (21 metres) of raised beds, a new garden bed that was dug up on the other side of a doorway, a couple of fruit trees that were donated, and 25 feet (eight metres) of strawberry beds. The school uses seeds from the seed lending library and relies on donations because funds are limited. “I think that good food should be available to all children,” said Lyons. “If you teach a child how to grow food, they will never go hungry. The low valued Canadian dollar and the drought threaten food security, putting good food further out of reach for some families,” she added. “You can buy fast food much cheaper than fresh fruits and veggies in the stores, so learning to grow your own food just makes sense. “I know from my own children that if you teach children how to grow their own food then later in life they will make better food choices. They realize how much better food tastes, how much better the texture is; they learn to experiment with food,” Lyons said.